40 years ago, forward-thinking men and women invented mountain biking right here in Marin on the flanks of Mt. Tam and Pine Mountain. These nature loving innovators, makers and free spirited artists are now internationally renowned for their contributions to society that go well beyond sport or engineering. Mountain biking has become a cultural touchstone in many communities around the world. For a brief moment in time, mountain bikers peaceably shared all the trails of Marin with other users. In 2019 though, mountain bike access to narrow trails in Marin is disproportionately low compared to other user groups locally as well as compared to mountain bike access in other parts of the Bay Area, California, the United States and worldwide. Unfortunately, mountain biking in Marin is sometimes portrayed as out of place on public lands, tolerated rather than celebrated. Mountain bike access is largely relegated to over-grade, rutted fire roads, many of which were built decades ago when recreation and environmental protection were scarcely considered. Such fire roads are not only less enjoyable, but they are less safe than narrow trails, which inherently keep speeds down while also drastically reducing environmental impacts. It is not easy to point to a single event or decision to explain why mountain bike access in Marin has historically been so contentious and restricted. Sadly, the public dialogue and legislative process have long been informed by a culture of misinformation and myths. On the bright side, Marin land managers are beginning to acknowledge and address the public’s desire for greater access. The process is slow, but positive. the fact is, there is no substantiated, reasonable cause to prohibit increased mountain bike access to narrow trails on public lands in Marin. There is nothing inherent nor unique about Marin — not topography, demographics, flora or fauna — that necessitates an overly prohibitive stance. Numerous peer-reviewed studies show both safety and environmental impacts from mountain biking are comparable to that of hiking and lower than that of equestrian use. Multi-use trails in Marin do not generate higher incident rates than bike-restricted trails. In fact, conflict and negative experiences on trails are extremely rare with the vast majority of all trail users reporting good to great experiences on trail. The statistics below are drawn from, among other sources, visitor use surveys conducted by Marin Open Space and Marin Municipal Water District, a trail conflict study contracted by California State Parks and several peer-reviewed research articles including work by Jeff Marion, co-founder of Leave No Trace and preeminent scholar on recreation ecology. Information on trail use conflict is primarily based on opinion; little data about actual user conflicts are available. Complaints and controversy about other trail users are common. Actual incidents, including those involving accidents, between trail users are relatively rare. Trail use conflict is an important social issue. Design of trails to accommodate multiple use helps to avoid or reduce conflict. User education and outreach are key methods to avoid or reduce conflict. The research shows the location, construction and maintenance of trails has significantly more impact on trail condition, sustainability and environmental impact than the subsequent usage. Yet coincidentally, the majority of mountain bike usage (cross country style riding) has one of the lowest use impact factors of usages that have been studied. In addition to both these findings, mountain bikers in Marin have proven to be engaged stewards by leading and supporting trail building, maintenance and clean up efforts throughout the county. Cross-Country type trails represent the vast majority of bike-accessible trails throughout the world. In Marin, all of the currently bike-legal narrow trails are cross country trails. Cross country also describes nearly all the trail mileage proposed for addition via the change-in-use and road-to-trail conversions. These are trails that already exist, require little to no modification and, considering the curvilinear use-impact relationship, would have minimal environmental impact and greatly reduce siltation. With that said, Marin cyclists are a diverse group and many seek more advanced, tecnically challenging trails. The variety of trails desired by off-road cyclists is similar to the range of trails enjoyed by hikers with different needs, skills and fitness. Diversity in a well managed trail network provides greater opportunities for recreation, helps disperse use across a wider area and also may help to reduce conflict, whether perceived or tangible. All around the country, the effort of local bike clubs in maintaining trail has been shown to be statistically significant and worthy of emulation. Marin is no exception. Local mountain bikers are leaders in trail volunteerism from the advocacy of sustainable, environmentally sound trail construction, to trail maintenance, to the removal of invasive species and to fostering an inclusive trail user culture. Marion studied 24% of the trails in this large region and created detailed descriptions, took numerous samples and measurements and made recommendations/summaries. Below is one such trail description. This 1.89 mile section of the West Bandy Creek Bike Trail traverses the western plateau adjacent to the Bandy Creek Road. It is primarily a bike trail (90%), but does receive limited hiking traffic (10%). Trail design is excellent. The grade, trail position, and soil type are well suited for bike use. The trail is narrow, and peripheral impacts are minimal. The trail was clear of blow-downs and other barriers. Although an isolated stretch is located on an abandoned road, the old width has been naturalized and a current narrow path persists. This trail receives maintenance from a local bike club. This low use bike trail varied little in tread width (15-33 inches). Mean incision (1 in) and cross sectional area (6 in2) measures were slightly lower than the average hiker trail, and considerably lower than the average of all trails combined. Trail grades ranged up to 25% with a mean of 3.5%. Tread substrates were predominately organic litter, exposed soil, and substantial amounts of vegetation cover. Excessive muddiness and erosion were only recorded 2 times each. 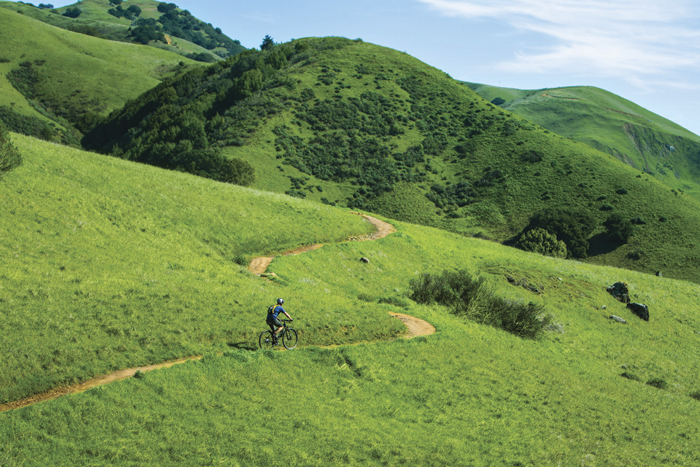 For a complete list of references, source material and additional information, see our Marin County Mountain Biking Fact Book.